Feet are bathed in warm water, some pressure-point work is applied, exfoliation and cleansing are the major points of this treatment. Restores the integrity of the feet. Stimulates the entire body from the feet up, you can feel grounded and lite at the same time. Session Time = 45min. 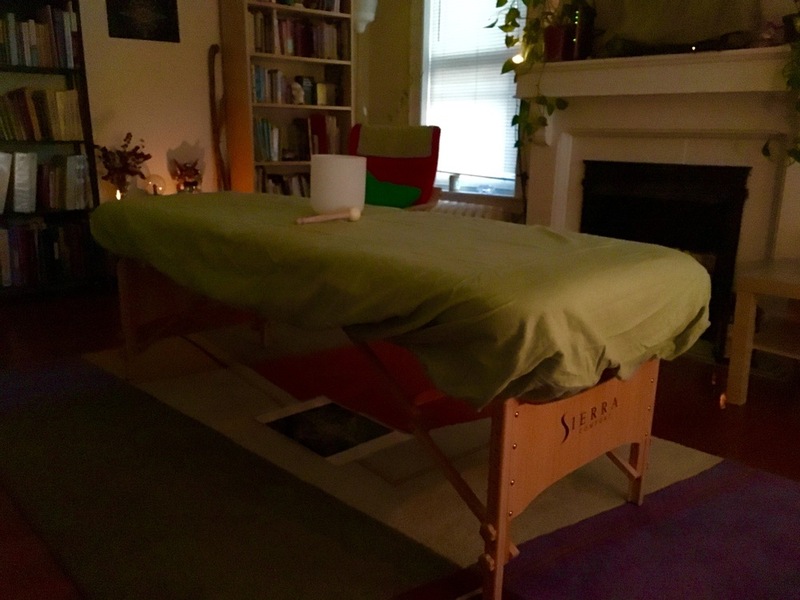 Chi Nei Tsang, or CNT, is an ancient form of detoxifying, energizing, abdominal massage. Chi, the life-force energy, moves through the body's internal channels, nervous system, blood vessels and lymph glands. These systems concentrate and cross paths in the abdomen, which acts as their control. Tensions, worries, and stresses of the day, month, or year accumulate and are seldom dispersed. These disturbances can cause physical tangling and knotting of the nerves, blood vessels, and lymph nodes. The result is gradual obstruction of energy circulation, which may lead to any number of maladies including, but not limited to, indigestion, constipation, bloating, insomnia, whole body toxicity, poor skin quality, and an inability to lose weight. I call this the "Mercedes Benz of Massages" because it is like no other. This traditional session where the body is completely covered with warm oils from head to toe, including the ears and a few drops of an herbalized oil in the nostrils. Oils are chosen based case by case and as per constitutional needs. Specific strokes and rhythmic patterns help facilitate a trance-like experience that takes individuals to a deeper place of healing from within. The lymphatic system is naturally stimulated here as well. Followed by the massage, a steam sauna treatment helps to detox they body deeper and allow the oils to penetrate. Session time = 1 hour. "The body of one who uses oil massage regularly does not become affected much, even if subjected to accidental injuries or strenuous work. By using oil massage daily, a person is endowed with pleasant touch, trimmed body parts, and becomes strong, charming and least affected by old age.— Charaka Samhita: Sutrasthana: V: 88-89"
"Abhyanga should be resorted to daily. It wards off old age, exertion and aggravation of vata." This combination an amazing way to treat yourself for the holiday's and it consists of Abhyanga (full body oil Ayurvedic Massage) and Shirodhara (stream of warm oil over the forehead.) The full massage involves oils designed and warmed per your constitution, followed by a steam sauna treatment. Lastly, the shirodhara will take it all to the next level as you enter what I call "instant meditation." This combination is a powerful treatment meant to detox and rejuvenate. You'll feel deeply relaxed! In Ayurveda, Panchakarma is considered non-surgical surgery where cellular metabolic toxicity, developed from emotional and biological accumulations is safely and specifically removed from the body layer by layer. Panchakarma (five cleansing actions) involves an intense process where a specific protocol is designed to meet your individual needs and supports your health from the inside out. 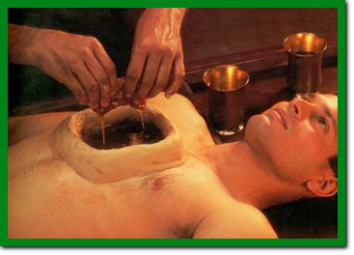 According to Ayurveda "Panchakarma adds 15 years to a persons life." Panchakarma begins with a consultation to determine where you are with health and in reference to where the toxins are. Daily treatments are implemented, along with herbs so that the body is ready to eliminate these toxins via certain routes of the gastrointestinal tract, then any one or more of the five cleansing-actions involved in panchakarma is provided and supervised. Room and board are available for this retreat and can be anywhere from 3,5,7,9 days. Meals may or may not be included, depending on the individuals' case. Additionally, Panchakarma is done on a case by case basis and not all who inquire are eligible. "It is strongly suggested to have PK done seasonally or at least once a year." Contact me for further inquiry, and you can google Panchakarma for more details. Time = Time = 3, 5, 7, 9, and 14 day Click HERE for more details. An authentic localized traditional treatment for relieving stress and stiffness in your joints or back. Cotton and linen pads ‘Pichu’, soaked in hot medicated oils are gently placed on sore joints or back to offer immediate relief from pain and discomfort. The warmth of the soaked pads seeps into the body and induces a deep sense of relief. Short, gentle and rhythmic massage strokes followed by a medicated herbal pack further alleviate stress and enhance the healing process. Emerge from this treatment with renewed agility and comfort. At least three treatments of Pichu are recommended for maximum benefit. 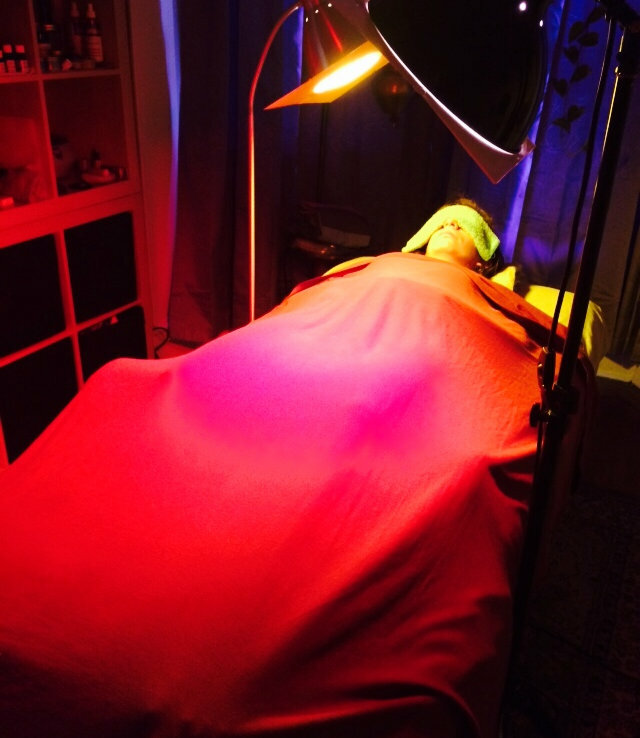 Treatments are approximately 1 hour which also include massage of extremities and head. This session is similar to Pichu where the head and extremities of the body are oleated but instead of using a localized pad of oil to a particular location a localized steam is applied. This treatments benefits inflammation, pain and discomfort in the joints and general support of circulation. It also helps to relieve stress in the body. Ayurvedic Massage and SaunaTherapy Increases circulation, cleanses the lymphatic system, detoxifies and revitalizes the body. Warm oils are uniquely blended per your constitutional type. Also combined is Marma Therapy which enhances the healing capacity of the body by balancing specific subtle points and pathways. A sauna treatment is also the final step to enhancing the effects of this bodywork. Session Time = 1.5 - 2hrs. Nature's facelift designed to help slow the aging process and restore your natural beauty. This is what I would like to call a "Natural Facelift." From exfoliation to moisturizing, fresh fruits, herbs and oils are used according to your unique skin type. Session Time = 45 min. Hearing is connected to the air element, so the ear is where Vata collects. Treating the ear with warm sesame oil and massage is an effective way of calming the nervous system. Effective treatment for reducing Vata, jaw tension, tinnitus (ringing in the ears), sinus infections, sore throats, colds, and head congestion. Session Time = 30 - 45 min.